A Kickstarter campaign recreated the golden records to make them available to the public for the first time ever. In 1977, NASA launched two spacecraft that would venture far out into deep space, each carrying a golden record with a message from Earth for any aliens the vessels might encounter. Now, for the first time ever, that record will be available to people on Earth. A new Kickstarter campaign is making copies of that golden record available to the public. Other than the two copies on NASA's twin Voyager spacecraft, only 10 copies exist, most of which are on display in NASA facilities. Even Carl Sagan, who led the golden record project, could not get his hands on a copy. But now, David Pescovitz from the website Boing Boing and Institute for the Future, Timothy Daly of Amoeba Music, and designer Lawrence Azerrad have come together to create near-exact replicas of the gold-plated phonograph records to celebrate the 40th anniversary of the Voyager launches. 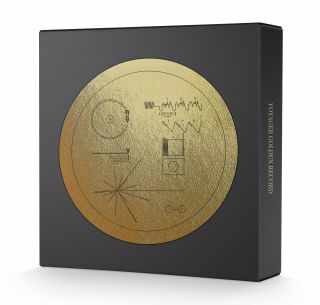 Reserving a copy of the golden record costs $98, but the campaign also offers smaller, Voyager-themed gifts for smaller donations of $10 and up. The Voyager Golden Record remake comes in a set of 3 gold vinyl LPs. A $98 box includes three translucent gold vinyl LPs, a hardbound book, a digital download card for all the audio and a lithograph of the iconic Voyager Golden Record cover diagram. The original gold-plated copper records contain sounds and images that represent the human race and explain the spacecraft's Earthly origin. They feature 27 tracks of music from around the world, with artists ranging from Beethoven to Chuck Berry. The audio includes greetings in 55 different languages and natural sounds like thunderstorms, erupting volcanoes, crashing ocean waves, a crying baby and several animal calls. The Voyager Golden Record: 40th Anniversary Edition Kickstarter campaign is accepting contributions until Oct. 20, and the records are expected to ship in August 2017. So far, the record has been a hit, as the project has raised almost four times its initial goal of $198,000. Meanwhile, the twin Voyager spacecraft continue to carry the two original golden records farther than any record, or spacecraft, has ever gone. Voyager 1 left the solar system and entered interstellar space in 2014. Voyager 2 has not yet made it to interstellar space and is currently exploring the outskirts of the solar system.